Two first places for Helsby in this week’s round-up and a race that had no results! Wednesday night 23rd April saw the last Border League race held by Deestriders. A brief report as to the reasons why the results didn’t stand can be seen on the North Wales Blog below. 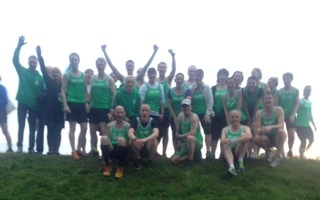 Thanks to Donna Geer/Mario who took a photo of the many Helsby runners on the night as seen below. 28 were out in all for Helsby, fantastic turnout. It was unfortunate that the race wasn’t validated and these things do happen from time to time but taking the season as a whole it was a fantastic series of races for Helsby ladies and promotion for Helsby men is definitely a good target for Borders 2014/15 and certainly achievable. Well done to Colin Bishop, first for his age category and to Tom DeJong picking up a 3rd junior title. Results for the other Border League races over the previous season can be seen below. It was the Delamere 5k Park Run on Saturday 26th with a great 1st place by the formidable Colin Bishop (undoubtedly one of the top ten runners in the country for his age group, so we should be very proud to have him for Helsby!) and first Helsby lady was Louise McEveley. Where was everyone this week? Saturday was also the Warrington 5k Park Run where sole Helsby representative Colin Thompson had a silver medal position for another great run. “Saturday morning… and afternoon I decided to take on the Highland Fling (a double marathon along the West Highland way between the start of the WHW (Milngavie) and Tyndrum). It’s a very popular race despite the clash with The Fellsman and many of the familiar faces were there; I’d headed up with three Spartans and Richie Webster from Wallasey RC. The weather was forecast to be atrocious so I was delighted to start without my waterproof on and pretty much stay that way for the entire race. My lack of race prep showed as I just didn’t’ have the miles in my legs unlike all the recent Helsby marathon heroes we keep hearing about, so after a surprisingly strong start I started to go backwards after about 20 miles. Still, I toughed it out (I can confirm that you don’t get any 50 miler for free) and focused on enjoying the scenery which was superb. It was a bit rough or “technical” underfoot around one of the lochs (earlier in the race you’d skip over it) and some of the trail was in very poor condition, but good company, well organised and one I’d certainly look to do again… but with full training next time! I finished in the top 10%, but only by virtue of it being such a big event (~800 starters), in 9 hours 45 minutes, best of all there was no ankle pain. Sunday 27th April was the Radcliffe 10k Multi-terrain race and a Viking raid by Jayne Joy saw her secure a fabulous victory against some talented opposition and a PB too on an undulating course shows the sort of form she is in. There was as usual great support from Joe and Colin’s wife Jane was also out offering fantastic support on the night. Helsby also had a couple of first place finishers, with many others in the top three for their respective age categories. Colin B and Albert brilliant as ever with another great run from Colin Thompson establishing himself at the top end of the field. It was good to see Ian Landucci back from injury too and to have so many Helsby ladies out to secure them a 3rd place in the team standings in the top division. Now we have more consistent strength in the men’s side of the club maybe looking for Border League promotion next season or beyond can be a distinct possibility and something for the club to aim for. Saturday was the 7th Delamere Park Run with less Helsby runners than of late but with some of the usual park runners helping out on the day saving themselves for Sunday and the Whitley 10k. Adrian was first in for Helsby for the men and Janet for the ladies. Well done to all who ran. Andy Robinson probably did a 5k warm up just for his 37 mile run also on Saturday. This was the Calderdale Hike which Andy achieved in an impressive 7hours 40 minutes. This race was his 3rd in the RunFurther Ultra Series. Sunday was our 2ndroad counter of the season. I’ve received a race report from Ed as below. Well done to Gareth and Carol leading the Helsby charge. Sunday was also the Lymm 10k featuring Helsby’s Colin Bishop. Colin is in a great run of form and on a windy course managed a superb 8th from over 700 runners easily securing first in his age category in 38.04. Thanks to all those who ran at the Border League Race on Sunday. A short course of 4.5 miles but with a decent hill to test the legs and lungs and even a synthetic running track lap for those with a pacy finish to a race. Positions and times attached. Congratulations to Janet Shaw for 1st in her age category, while husband Geoff took the easy option of the Wilmslow Half! Consistent running by Robbie too for a 2nd place. Hi all – Just a reminder that this Sunday is the 6th and penultimate race in the Border League Series. For those not trying the Cheshire GP Wilmslow Half then this 4.5 mile Borders league race might do the trick. Postcode is CH5 4BR. Remember that this event is free to enter but a club vest will be required. All positions finished really do help the club in their League positions. Any questions please email or ask at the club tonight. Oh I do like to be beside the seaside!!!! And we certainly were for Race 4 of the Border League series at Abergele on Sunday. It was an out and back 5 miler along the prom between Abergele and Llandulas with a minor excursion up and down a small hill through the caravan park at the half way point. The weather was fairly kind with the rain holding off till near the end of the race and only a light breeze coming off the sea. The next race in the series will be the Wrexham Tri event on Sunday 14th March so should be a good way to sharpen up before the summer road races get underway. Please note the next Border League is at Tattenhall on 3rd January. Many thanks to all who turned up. Let’s hope it continues.